9. How important are clothes to you? 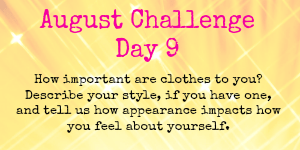 Described your style, if you have one and tell us how appearance impacts how you feel about yourself. I am by no means a fashionista, usually I get late onto the trend wagon, about 2 seasons too late to be exact. For me, I am very much a jeans and tee kinda girl, but that is only recently. This is what I call my mummy style. When I was working it was dress shirts & trousers or dresses with high heels. Though when I get the rare chance to dress up I love it. It does make me feel good about myself, and depending on what I am wearing makes me feel like a yummy mummy instead of a slummy mummy, which is what I feel the jeans and tee look is making me feel like. It’s like when I dye my hair, suddenly it gives me a little confidence boost. I am also not very label orientated, though my favorite is Bench Clothing. I am very much a high street kinda girl, though if I had the money I would love to shop in the cute little boutiques etc. ← I got my craft on!